At David Dexters you’ll see both of those – as you are greeted by Ben and Holly, who between them can meet all customer needs. Holly Tams has been working with us for four years, and has come across hundreds of customers in her time. Holly’s role is front of house but she also assists with transporting customers who are having work done on their vehicles, pricing, ordering, billing and more. No day is ever the same, which is why Holly enjoys the challenge. “We have lots of regular customers who I know well – and even with newer customers we always remember their cars. When you work in a garage the vehicles stick in your head,” she says. Good customer service is about the little things: greeting the regular customers by their first name or simply having a chat about their day or query – reassuring them that their vehicle is in safe hands. The motoring industry is very much thought of as a man’s domain – so what does Holly think about working as part of a male-dominated staff? David Dexters were finalists in the 2017 Excellence in Business Awards Customer Champion category with judges praising their aim to meet all customer needs. 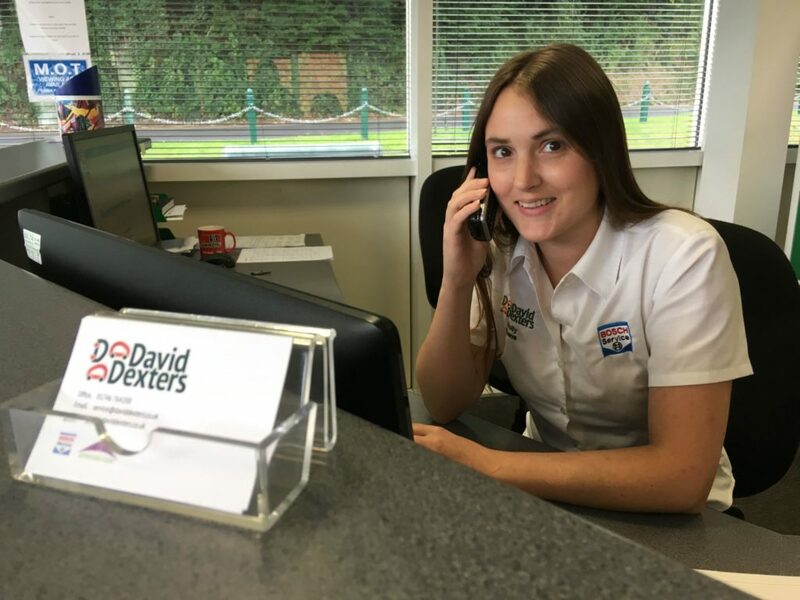 If you would like to chat to Holly or find out more about David Dexters give her a ring on (01746) 764200.